Simmer potatoes in water until tender, drain and cool. Cut potatoes in half. Coat steak with blackening spice. In large skillet, heat 1 tsp. oil; sear steak on both sides to desired doneness. Remove steak from pan and let rest. Wipe out pan, heat 2 tsp. oil. Add onions and garlic; season with salt and pepper. Sauté until soft, but not browned. Add spinach and sauté just until spinach starts to wilt. Mound spinach on 4 plates, dividing it equally. 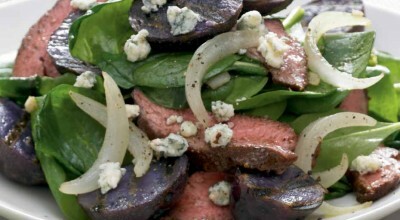 Carve steak into thin slices; arrange on top of spinach. Top with potatoes and sprinkle with bleu cheese. Serve with bleu cheese dressing on the side, if desired.